Melissa Gallo and I were having a Go To Meeting, and we started playing with the new Corel Painter Essentials 5. After playing for a while, we decided to record the rest of the session and share with you. Corel Painter Essentials 5 is and upgrade to Corel’s popular Painter Essentials 4. It is an extremely rich program for a small price. Melissa and I barely touched the features included with Essentials 5. I did a quick watercolor from scratch and a auto-painting with some extra brush work using oil type brushes. I hardly touch oil brushes anymore, but Melissa made me…just kidding. Do go to Corel Painter Essentials 5 web site and check out all the new stuff added to this version of Essentials. The list includes NEW…particle brushes, mirror and kaleidoscope painting, user interface, navigator, brush tracking utility, 2 in 1 mobile painting interface, real-time effects preview, transformation tools, native 64 bit for Mac and PC, plus more. And I didn’t even get to the enhanced features. The best part, Corel Painter Essentials 5 is on sale for $39.99 until November 28th. I think that is an amazing price. During the recorded video I created two images, one from scratch and the other using Essentials Photo Painting features. I wasn’t thinking when I finished the watercolor roses and I deleted the image without saving. I was not interested in saving the image, but without it, I didn’t have anything to post on my blog. So…I made a similar image off camera for the blog. Video of meeting between Melissa Gallo and Skip Allen. Skip paints two images…check it out. OK folks, that’s it…two posts in one day. Wow. 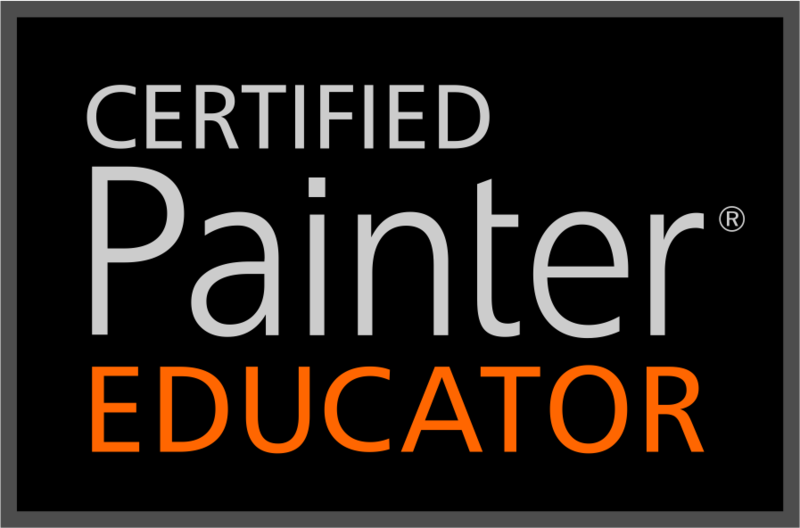 This entry was posted in 2014 Corel Painter Posts, Skip Allen & Painter 12 and tagged Corel Painter Essentials 5, Melissa Gallo, Painter Essentials 5 tutorial, Skip Allen. Bookmark the permalink. Hi Skip, Very Neat! If I run across some folks who want something like this I will let them know. Do you know if they will coming up with a more current app for the IPad, I know they have something for android tablets. Thanks and Happy Birthday again! I don’t know if they are working on an app for the iPad. I know lots of folks will want one. Thanks for the second birthday greeting…it was a very special day. Hi Skip, I have just watched the video you posted and am wondering how to get rid of the vignette – it got a mention, but no explanation. In Essentials 4 it was easy to remove. I have just bought 5 in a rush of excitement and as it is new there is not a lot of info just yet. Thank you for such an informative video. I have just played a bit more with Essentials 5 and I cannot find a way to disable vignettes…odd. I’m not going to give up, but at first look, I do not see one. You could crop the image so the vignette doesn’t show…as long as there are no very important elements along the edge. I also auto-painted using illustration and then oil on separate layers. With oil on top, I changed the composite method to gel and reduced the opacity of the layer. That filled in the edges…not saying it is a good solution…but playing with that concept may get what you want. Also, you can paint in the edges using the paint by hand function, but I would probably just paint the whole thing and not use Auto-Paint. Sorry, I can’t be more help. If I find the solution, I’ll let you know. There isn’t a dodge and burn tool in Painter Essentials that I know of. I guess I would adjust value with color changes like I would do if painting traditionally. HI Skip….thank you for your reply, there are dodge and burn tools in Corel Painter Essential 5. I guess same as in Photoshop you can use any brush once you have selected the dodge or burn tool. I just thought you might of had a specific suggestion.